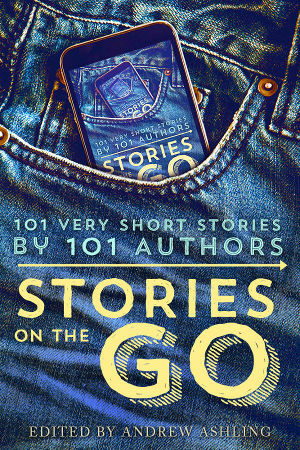 Stories on the Go is an anthology of 101 Very Short Stories by 101 Authors. The idea was launched by Hugh Howey of WOOL-fame on Kboards, a forum for kindle readers with an active — well, turbulent — community of indie writers. Somehow I ended up coordinating this project which aims to give you an idea of recent indie writing. Oh… and you can download the ebook for free on several vendors. Stories on the Go is a collection of very short stories, thousand words or less, by very different authors who write in many genres. There is, besides the usual Table of Contents, and Index by Author and an Index by Genre. There are a few gay/m-m stories besides my own. Since these are very short stories you can read them easily in five minutes, e.g. on your smartphone while queuing, or on your tablet or ereader while commuting. My own story, The Fiar, is set in the world of the Spencer boys of Just Don’t Mess With Us. You’ll recognize a reference or two if you’ve read these stories. By the way, I’ll have more to say about Just don’t Mess With Us in my next post. That said, I’m not a master of the short form, so this story is actually more a slice of life, an incident. I hope you’ll like it anyway, and that you will enjoy the other stories as well. Alright already, where can I download this thing? If you want to receive an email when I publish a new book, and while it’s still available at a lower introduction price, please subscribe to my New Releases Newsletter. As the author of a recently released anthology of 100 Flash [Micro] Fiction myself I can understand the effort it takes in writing stories of this brevity. The ones in my book on the average are only five sentences long and the longest one is less than 390 words. I’ve got your book on my long TBR list of books to read/review. Why not place your book on a giveaway on GoodReads? Thanks for the Goodreads tip, Robin. And have a great week yourself. You’re quite welcomed Andrew and THANKS for your kind wishes for my week. enter the drawings hoping to snag one of the FREE BOOKS being offered. Sometimes if they don’t win they go back and buy a copy of the book. I especially love the ones which have been signed by the author. The giveaways on GoodReads is one of the sources for the books I review as I don’t accept any requests to do a book review. Thanks so much for doing all the work on this, Andrew! It was pleasure, Ruth. Everyone involved was patient and easy to work with. And I had a lot of help from our team of typo hunters. Hope you enjoy the stories, Fausto. Thanks, Joel. Glad you think so. Great job, Andrew! Thanks for putting all the work in. Thanks for the compliment, Geraldine. It was a pleasure, and I had great team of volunteers to help me.